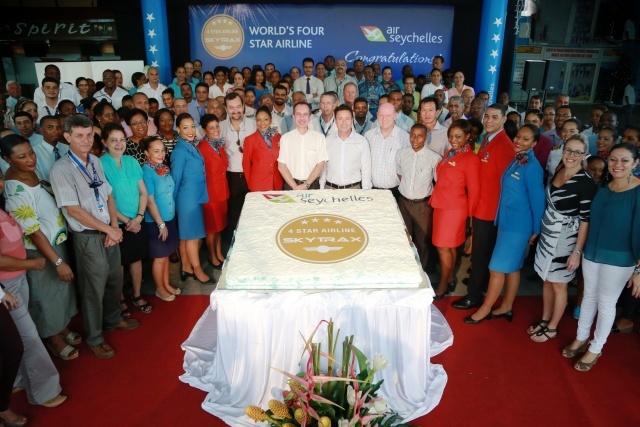 (Seychelles News Agency) - The national carrier of the Seychelles has been awarded the 4-Star airline ranking by airline review organisation, Skytrax, Air Seychelles’ chief executive Cramer Ball announced today. The new status also make it the second best airline in Africa, said the airline. “We are absolutely delighted to receive this recognition. We have been working very hard to enhance our product and service offering, ” Ball said during a ceremony organised for staff and partners to mark the achievement at the country’s international airport on main island Mahe. “We knew we were becoming a great airline and we wanted to make that official. So we invited Skytrax to audit us, to give us an independent, unbiased reading of where we stand on a global basis,” he said. Home affairs and transport minister Joel Morgan, who also chairs the airline’s board, said words cannot adequately say how amazing the accomplishment is, “especially considering how uncertain our future looked two years ago”. He commended the airline’s staff, 97% of whom he said come from the archipelago of about 90,000 inhabitants. Skytrax says on its website that its 4-star airline rating is “a seal of quality approval presently awarded to 36 airlines, recognising airlines that deliver a good overall quality performance. On another website Skytrax lists only seven 5-Star airlines, namely All Nippon, Cathay Pacific, Qatar, Hainan airways, and Malaysian, Singapore and Asiana airlines. Ball said Air Seychelles will now seek to be a 5-star airline.